Last weekend's Prizefighter Semi-Finalist John Watson has been handed a tasty looking domestic clash with former European champion Jason Cook on the undercard to the big grudge match between Tony Bellew and Danny McIntosh. "Every fighter wants to fight in front of thousands of fans in their hometown arena. For me, this fight is massive. I'm feeling strong at the weight, i can punch and i can box. What you saw in Prizefighter against Harrison was only a taster, I've got another full camp ahead at Oliver's Gym and I'll be even better. Even stronger and more powerful with it too. Me against Jason Cook is an exciting fight, it's a great fight for the fans to watch and it's a great fight for me to work hard for. He's ranked in the top 6 in the British ratings, he's former European Champion, he's quality. You know what u get with Cook.. He's a real banger. I know he'll be looking to take me out no matter what he says in the build up. He's a nice fella, but in the ring he'll want to knock me out no doubt about it. It's great to be back at the Echo, it's going to be a great night with a great atmosphere. 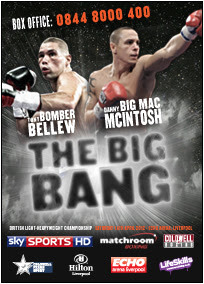 I sell a lot of tickets in Liverpool, and on the undercard to Bellew its gonna be bouncing in there. Tony and McIntosh are gonna have a real tear up no doubt but me against Cook is something you can't take your eyes off either. We might not have the grudge that they have, but styles make fights and this is boxer against puncher. But a boxer that can now bang too!" 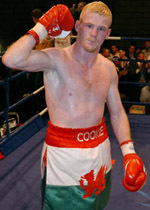 Cook, who has had two dates with Curtis Woodhouse postponed is eager to get back in the British Title mix and doesn't mind facing quality boxer's in order to get another crack. "I'm really looking forward to this. John is a class operator who i think was weight drained in his two British Title losses. 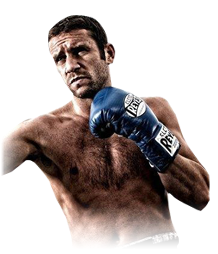 I thought he looked great in his first fight in Prizefighter and showed some real power in there. As for his semi-final loss, Adil Anwar can make anyone look bad, especially over three rounds so i don't look into that too much really. I think obviously I'm the bigger puncher, my record speaks for itself and at a good level. People think I'm just a puncher though but i showed i can box when i fought Daws and Theophane. Having said that, i really believe one of us will get stopped in this fight, and i really don't think it will be me! Stoppage or not, I'm confident. He can box and fight, but i think he's going to feel the pressure at home on a massive show whereas as for me.. i went to Italy to knock out the guy and win the title. I want that last British Title shot. I want it this year, and if the only way for me to get a crack is to beat good names and good fighters like John then line them up and I'll take them out. Mark my words, I'm going to be British champion this year." Promoter David Coldwell who made the match with Matchroom's John Wischhusen commented "Obviously I'm delighted to have a quality fight like this on the show. I'm sure the clash in styles will have fans on the edge of their seats, be it at home or watching on Sky Sports. John has shown he's a bit more powerful up at the new weight, he still is probably technically the better boxer whereas Jason is without doubt the puncher of the two. Both can be hit so i think we're in for a cracker." John Watson v Jason Cook over eight rounds at light-welterweight features on the undercard of 'THE BIG BANG' TONY BELLEW v DANNY McINTOSH.